EGFR-activating mutations are predictive of high response rates and overall survival gains in patients (pts) with pulmonary adenocarcinoma, treated with EGFR- tyrosine-kinase inhibitors (EGFR-TKIs), as erlotinib. Mutations in the EGFR gene, especially in the exon 20 (T790M), are related to resistance to EGFR-TKIs. We investigated if a polymorphic DNA sequence in exon 20 (Q787Q, NCBI database 162093G>A, SNP ID: rs1050171) was associated with clinical outcomes in pulmonary adenocarcinomas, treated with erlotinib. It is a prospective, observational study on all consecutively pts whose tumors were genotyped for EGFR-activating mutations. Tumor samples were formalin-fixed and paraffin-embedded. Tumor areas were selected and macrodissected, followed by whole DNA extraction and amplification by PCR. EGFR genotyping was performed through DNA sequencing (exons 18, 19, 20 and 21) by Sanger´s methodology. Pts with adenocarcinomas harbouring EGFR-activating mutations were treated with erlotinib. 191 pts had tumor samples genotyped between Aug/2011 and Apr/2013. Median age was 64 y (17-90), 106 (56%) female. According to ethnicity, 154 pts were Caucasian (81%), 26 African-American (14%) and 11 Asian (6%). Seventy pts were classified as never-smokers (37%), 23 (12%) as light-smokers (≤ 10 p.y.) and 95 as current smokers (51%). EGFR activating mutations could be identified in 54 out of 191 samples (28%): 35 were exon 19 deletions (65%), 15 were L858R mutation in exon 21 (30%), and three were rare mutations (G719S and G719A in exon 18, and V774M in exon 20). Polymorphism Q787Q in EGFR gene (exon 20) was detected in 108 samples (56.5%). The polymorphic status did not correlate with gender (p=0.324), smoking status (p=0.810) or EGFR mutational status (p=0.238), but it was more frequently detected in Caucasian pts (p=0.0002). Considering all 191 studied pts, no difference in median overall survival was detected according to polymorphic status (19.6 mo. vs. 24.3 mo., HR 0.86; 95% CI 0.54-1.38, p=0.541). There was no difference in response rate to erlotinib according to the polymorphic status (p=0.248). In addition, no difference in median overall survival was detected according to polymorphic status among the 38 pts treated with erlotinib and presenting EGFR-activating mutations (not reached in both groups, HR 2.44; 95% CI 0.31-16.01, p=0.425). Polymorphism Q787Q in EGFR gene (exon 20) was commonly detected in pulmonary adenocarcinomas (56.5%), being more frequent in Caucasian pts. The presence of polymorphic status was neither related to sensitivity to erlotinib, nor to survival outcomes in our pts. Lung tumors with EGFR Exon 20 mutations, particularly insertions between the amino acids Y764 and V774, present a major challenge for treatment. These mutations are known to confer resistance to current EGFR specific tyrosine kinase inhibitors (TKI). The mechanism of this resistance is described by Yasuda et al. as a “wedge” formed by the aberrant amino acids locking the C-helix in an inward, active position. This structural aberration prevents the TKI from accessing the critical pocket within the protein and inhibiting kinase activity. Without the ability to treat these tumors with TKIs, alternate treatments need to be pursued. We present, as index cases, two patients with metastatic lung adenocarcinomas demonstrating TKI unresponsive insertions in exon 20. Both patients had exuberant clinical and radiographic responses to cetuximab, an EGFR specific monoclonal antibody. The first patient is a 39 year old male never-smoker with lung adenocarcinoma. The disease had progressed prior to molecular identification of the EGFR mutation, and the patient developed bilateral lung disease and metastatic lymph node and brain lesions. An exon 20 EGFR mutation (p.N771_P772insPHGH c.2313_2314insCCCCACGGGCAC) was identified. Following 4th line therapy with combination chemiotherapy plus cetuximab, the tumor burden was dramatically decreased and the patient had markedly improved functional status with the ability to return to employment. The second patient is a 71 year old male never-smoker with lung adenocarcinoma. The disease progressed and the patient developed widely metastatic disease. An exon 20 EGFR mutation (P770_N771insNPP) was identified. The patient was treated with combination cetuximab and afatinib therapy and experienced a dramatic decrease in lung and metastatic tumor burden with improved functional status. Cetuximab-containing therapeutic regimens may be a viable therapy for what previously have been considered treatment resistant molecular insults. Additional cases of these mutations and treatment with cetuximab are needed to demonstrate that these results are reproducible and that they warrant study in prospective clinical trials. IASLC Members: To view this content or have the option to purchase this event, click here to login. Conference Attendees & Access Code holders: Click here to enter your Access Code. Already entered your Access Code? Please login. Lung cancer remains a leading cause of mortality worldwide. Evolution in molecular biology has expanded and the identification of somatic mutations in the epidermal growth factor receptor (EGFR) as a clinically relevant oncogene also selected a subgroup of patients. Most commonly described as activating mutations, both deletion of exon 19 and L858R point mutation in exon 21 account for nearly 90% of all EGFR mutated patients. These patients usually benefit from tyrosine kinase inhibitors (TKIs). On the other hand, some patients harboring specific EGFR mutations – such as exon 20 insertions – do not benefit from the same strategy. We describe a case report of a patient with advanced lung cancer. A female, 39-year-old patient was first diagnosed in late 2015 when she presented with dyspnea and lower back pain. Biopsy of the primary lung mass as well as a bone lytic lesion both revealed an adenocarcinoma. PET-CT showed extensive lymphangitic carcinomatosis, bone and cervical lymph node involvement. She underwent 5 cycles of cisplatin-pemetrexed with a good radiologic partial response and very good clinical response. During chemotherapy, the first molecular test (Cobas Z 480 Roche) became available showing an insertion of exon 20 in the EGFR gene. Patient then requested an alternative treatment given that she was not inclined to accept maintenance with chemotherapy. We then proposed a short trial with afatinib, even though the chances of response were very low. She was started on afatinib PO 40mg/day on March 14[th,] 2016. Three weeks later the patient developed a grade 3 diarrhea and the drug was withheld until her symptoms resolved. She resumed afatinib PO at 30mg/day on April 20[th,] 2016. Her first radiologic evaluation two months later showed stable disease and she was kept on treatment and reported to feel healthier. Her second evaluation on November 2016 then showed a partial response, mainly in the bone and she was continued on oral TKI. New imaging studies on March 2017 revealed a progression of her disease only 12 months later. There is a lack of data addressing patients harboring rare and unique EGFR gene mutations. Most exon 20 insertions identified in patient samples have not been tested against reversible EGFR TKIs. Extrapolations from the few tested mutations might not apply for other exon 20 mutations. It is imperative that patient-derived cell lines of common EGFR exon 20 insertion mutations are developed to enhance our preclinical understanding on these tumors. Clinical features of epidermal growth factor receptor (EGFR) mutations: L858R, deletions in exon 19, T790M, G719X, and L861Q in non-small-cell lung cancer (NSCLC) are well-known. The clinical significance of other uncommon EGFR mutations, such as A763_Y764insFQEA, is not well understood. This study is aimed to improve the understanding of A763_Y764insFQEA, and the clinical response to icotinib of NSCLC patients with such an uncommon mutation. Six cases of EGFR exon 20 A763_Y764insFQEA mutation and twelve cases of EGFR exon 20 other insert mutation NSCLC patients were retrospectively analyzed until the progress of the disease or the emergence of the side effects and clinical efficacy was observed after months of followed-up. Six cases with EGFR exon 20 A763_Y764insFQEA and twelve cases of EGFR exon 20 other insert mutation NSCLC patients mutation manifested the median PFS (9.0months vs 1.2months, P<0.001). Clinical efficacy of icotinib with advanced NSCLC harboring EGFR exon 20 mutations between A763_Y764insFQEA and other insert mutation (ORR:33.33%, DCR: 100% vs ORR: 0, DCR: 16.16%). EGFR exon 20 A763_Y764insFQEA mutation of clinical benefit from icotinib is remarkable, and it close to the common mutation of clinical benefit. It illustrates the value of in-depth molecular testing with NGS of EGFR wild type NSCLC patients. The EGFR Exon 20 T790M mutation is nowadays widely mentioned in studies on the treatment of non-small cell lung cancer. Especially the secondary mutation T790M or accquired T790M mutation. Aims: I.Investigation of EGFR Exon 20 T790M mutation appears secondary to treatment with targeted therapy or chemotherapy. II.Ability to diagnose EGFR Exon 20 T790M secondary mutation of clinical specimens: Histology - Cytology - Plasma. * Retrospective study, statistics describing series of clinical cases. * Collect EGFR mutation data in 3 groups: histology, cytology and plasma. * Use RealTime PCR on cobas @ z480 to perform EGFR mutation diagnosis. * All patients have admitted to the hospital. Pham Ngoc Thach with diagnosis of advanced stage non-small cell lung cancer (IIIB and IV) with the following requirements: - They have been treated witht the target therapy or chemotherapy. Then, the disease progresses back to the standard RESIST 1.1. - There has been an initial diagnosis of EGFR mutations. - Diagnosed with mutations in EGFR with samples: histopathology, cytology and plasma. * Primary EGFR Exon 20 T790M mutation: 7 cases: 4.07%, including 4 simple mutation (2.33%) and 3 combined mutations (1.74%) (Exon 20 T790M + Exon 20 G719X, Exon 20 T790M + Exon 19 Deletion; Exon 20 T790M + Exon 20 S768I). * Secondary EGFR Exon 20 T790M mutation: high rate: 97 cases (56.39%). Compared with other studies in the world, especially in Asia, the values are similar (P = 0.059 - 0.088> 0.05). ⇒ We have been presented the statements: - The EGFR Exon 20 T790M mutation was significantly higher in the primary EGFR mutation group (97 cases vs 7 cases: P = 0.0047 <0.05). - Comparison of mutant EGFR Exon 20 T790M mutation with other studies in the world of the majority showed similar results (P = 0.051 - 0.081> 0.05). - Ability to detect EGFR Exon 20 T790M mutation among 3 groups specimens: Histology - Cytology - Plasma are similar. - With the RealTime PCR technique on plasma samples, it has been helpful in detecting this Exon 20 T790M EGFR mutation. Secondary EGFR Exon 20 T790M mutations are more likely to be present than in the primary group and predominate in the other secondary EGFR mutations. With the RealTime PCR technique on plasma samples, it has been very helpful in diagnosing this type of mutation. In contrast to other primary EGFR mutations in lung adenocarcinomas, insertions in exon 20 of EGFR have been generally associated with resistance to EGFR tyrosine kinase inhibitors. Their molecular spectrum, clinicopathologic characteristics and prevalence are not well established among Hispanics. Tumors harboring EGFR exon 20 insertions were identified through a comprehensive screening of 4.500 lung adenocarcinomas from diverse Latin American Countries. Cases were tested for common and uncommon EGFR mutations and KRAS. Almost all cases (n=52) underwent extended genotyping for other driver mutations in BRAF, NRAS, PIK3CA, Her2 and MEK1 by NGS (TruSight tumor[TM]), EGFR amplification, ALK and PDL1 protein expression (D5F3CDx Assay and 22C3 Clone). Clinical outcomes were evaluated using Kaplan-Meier and Cox proportional models. 60 patients were included; median age was 66-yo (r, 24-79), 63.3% were females, most patients had a micropapillary (38.3%) or lepidic (20.0%) adenocarcinomas, 61.7% were never smokers and 36.7% had brain metastasis at diagnosis. 14 patients (23.4%) had common EGFR mutations (del19/L858R) in addition to the exon 20 insertion, 5 (10.0%) had non-common EGFR mutations (G719X /L861Q/S768I) plus the exon 20 insertion, and two cases had additional mutations in PIK3CA and MEK1. Insertion sequences were highly variable, with the most common variant (V769_D770insASV) making up only 21.7% of cases. 30% of patients had amplification of the EGFR and 75% had a PDL1 expression level of less than 50%. Overall response rate (ORR) to the first line was 30%, progression free survival (PFS) was 8.3 months (95%CI 6.9-9.6) and OS was 17.4 months (95%CI 16.4-19.5). Prognosis was positively influenced by concomitant presence of common EGFR mutations (p=0.016) and by response to first line therapy (p=0.06). Patients with EGFR exon 20 insertions have similar clinical characteristics to those with common EGFR mutations but a poorer prognosis. The mean PDL1 expression in this population appears to be higher than in patients with common EGFR mutations, finding that promote the potential use of immunotherapy alone or in combination for this population. Background: Human epidermal growth factor 2 (HER2, ERBB2) gene alterations have been identified as oncogenic drivers in 2-5% of lung cancers. ERBB2 In-frame insertions in exon 20 (20ins) lead to constitutive activation of receptor and downstream pathways. However, response heterogeneity of different exon 20 insertions to ERBB2 inhibitor afatinib exists. In vitro and structural modeling results suggested that Glycine778 may facilitate inhibitor binding to ERBB2. In this study, our aim was to improve our understanding of clinical characteristics in ERBB2-mutated Chinese lung cancer and investigate the clinical outcomes of specific ERBB2 exon 20 insertions in response to afatinib. Methods: We reviewed 7520 lung cancer patients whose tissue or plasma biopsies were sequenced in a CLIA-certified sequencing laboratory between 2015 to 2018. Clinical records of 19 patients (18 adenocarcinomas and 1 squamous cell carcinoma) with several different ERBB2 20ins after afatinib treatment were collected for clinical outcomes evaluation. Results: ERBB2 20ins were identified in 2.27% (171/7,520) in this Chinese lung cancer cohort. It occurred with a high proportion in females with adenocarcinoma histology. 11.7% (20/171) ERBB2 20ins-positive patients harbored concomitant ERBB2 amplification. Y772_A775dup (119/171, 69.6%) was the most frequently occurred 20ins subtype, followed by G778_P780dup (18/171, 10.5%). For the 19 patients treated with afatinib, they had a median PFS of 4.5 months and median OS of 11.5 months. The overall response rate in this cohort was 15.8% (3/19) and disease control rate was 68.4% (13/19). Next, we interrogated the clinical outcomes of specific 20ins subtype responding to afatinib. We found that patients harboring G778_P780dup (G778) achieved longer median PFS (10 vs 3.3 months, p=0.32) and median OS (19.7 vs 7 months, p=0.16) than non-G778 patients, consisting with in vitro results. Although statistical significance was not achieved due to limited number of G778_P780dup patients, this result warranted further investigation into this phenomenon. Moreover, to the best of our knowledge, we identified the first case of a lung squamous cell carcinoma patient harboring ERBB2 20ins from this cohort. He displayed favorable response to afatinib and achieved partial response with significant tumor shrinkage. Conclusion: We interrogated the characteristics of ERBB2 exon 20 insertions in a large cohort from single ethnicity. It demonstrated the response heterogeneity to afatinib among different ERBB2 exon 20 insertion subtypes. It highlighted the importance to correlate drug efficacy with specific ERBB2 exon 20 insertion variants in clinical application. Oncogenic HER2 mutations are present in 2-4% of adenocarcinoma of the lung. However, clinical trials of HER2 inhibitors such as afatinib or neratinib has been unsatisfactory. Recently, a novel HER2 inhibitor, poziotinib has been developed and clinical trial results are being expected. Here, we evaluated poziotinib in comparison with pre-existing TKIs using Ba/F3 system. We also derived resistant clones against poziotinib and investigated their resistant mechanism. We introduced three common HER2 mutations into Ba/F3 cells (i.e. G776delinsVC (VC), A775_G776insYVMA (YVMA) and P780_Y781insGSP (GSP)) which account for 13, 72, 9% of HER2 mutations in human lung cancer, respectively. We defined sensitivity index (SI) as an IC90divided by trough concentration of a given drug at the recommended dose for humans in the literature, as a surrogate for drug activity in humans. Poziotinib activity was compared with 8 TKIs (afatinib, osimertinib, erlotinib, neratinib, lapatinib, dacomitinib, irbinitinib, and AZ5104). In addition, we created resistant clones by exposing poziotinib in the presence of N-ethyl-N-nitrosourea (ENU) and HER2 secondary mutations were searched. All drugs but lapatinib showed the highest activity against VC (Table). In contrast, YVMA was most resistant in all but neratinib and poziotinib. For most common YVMA, poziotinib was the only drug that had SI of less than 10 (Table). Furthermore, poziotinib was most potent for VC and GSP except dacomitinib for GSP (Table). We established 19 poziotinib-resistant clones, all of which harbored C805S secondary mutation of the HER2 gene homologous to C797S of the EGFR gene. Poziotinib showed the most potent activity against HER2 exon 20 mutations. We also found that secondary C805S HER2 mutation was the common mechanism of acquired resistance, which most likely inhibit covalent binding of poziotinib with HER2. TAK-788 (AP32788) is an investigational tyrosine kinase inhibitor (TKI) with potent, selective preclinical activity against activating EGFR and HER2 mutations, including exon 20 insertions. We report early results of a phase 1/2 first-in-human, open-label, multicenter study of TAK-788 (NCT02716116). Patients with advanced non-small cell lung cancer (NSCLC) refractory to standard therapy received daily oral doses (5–120 mg) of TAK-788 in the ongoing dose-escalation phase (3+3 design). Preliminary antitumor activity (by RECIST v1.1), safety, and PK are reported for patients who received ≥1 dose. As of 8-Sep-2017, 34 patients (median age, 60 y; female, 65%; ≥2 prior anticancer therapies, 88%; Table) were treated with TAK-788; 10 remain on treatment at data cutoff. AUC0‑24,ss increased in a dose-proportional manner over the dose range evaluated; the effective t1/2 was ~16 (range 6–28) h. The most common treatment-emergent AEs (TEAEs; ≥20%) were diarrhea (47%), nausea (26%), and fatigue (21%). Grade ≥3 TEAEs in ≥2 patients (excluding disease progression) were dyspnea (n=3, 9%) and anemia, asthenia, dehydration, lung infection, pleural effusion, pneumonia, and pneumonitis (n=2 each, 6%). Two DLTs, both pneumonitis, were reported (80 mg, grade 3; 120 mg, grade 5). Of 14 evaluable patients, 3 had PR (80 mg, n=2, both confirmed; 120 mg, single PR awaiting confirmation), 6 had SD (40 mg, n=3; 80 mg, n=2; 120 mg, n=1), and 5 had PD as best response (40 mg, n=3; 80 mg, n=1; 120 mg, n=1). All patients with PR had EGFR exon 20 insertions. TAK-788 exhibits antitumor activity in patients with EGFR exon 20 insertions with an AE profile consistent with other EGFR TKIs. Phase 2 will begin after determination of the RP2D, with 4 molecularly defined cohorts in NSCLC. Updated data will be presented, including the recommended phase 2 dose (RP2D). a One patient (20 mg) had both EGFR and HER2 mutations; 1 patient (80 mg) had EGFR exon 20 insertion + T790M. There are limited epidemiological data on non-small cell lung cancer (NSCLC) patients with non-classical (uncommon) epidermal growth factor receptor (EGFR) mutations. In light of ongoing development of TAK-788, we describe the global frequency and spectrum of EGFR exon 20 insertions in NSCLC based on a comprehensive literature review as well as highlight possible regional variations. A literature search was conducted to identify publications reporting the frequency of EGFR exon 20 insertions in unselected NSCLC patients. PubMed and ASCO, ESMO, and IASLC meeting abstracts were searched up to April 2018 using the following keywords: non-small cell lung cancer, epidermal growth factor receptor, exon 20, insertions and uncommon mutations. Only publications in English were included. The pooled frequency of EGFR exon 20 insertions for each country were determined, and insertion variants (where available) were described at the global level. A total of 26 studies from 25 countries were included, reporting on 569 patients with EGFR exon 20 insertions among 41,321 NSCLC patients. 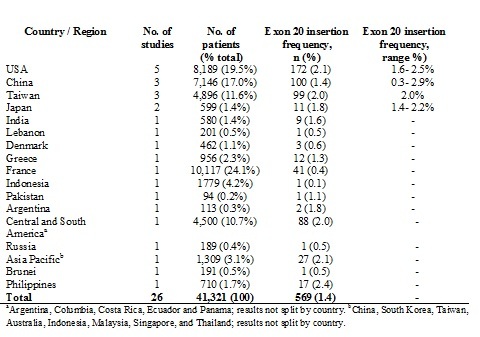 The highest mutation frequency was seen in China (2.9%) and the lowest in Indonesia (0.1%). When pooled by country, exon 20 insertions were found in 0.1−2.1% of all NSCLC. Over 50 insertion variants were reported, covering amino acids 761−774. The most commonly detected mutations included D770_N771insSVD, V769_D770InsASV, H773_V774InsH, H773_V774insNPH, and A763_Y763insFQEA. The frequency of EGFR exon 20 insertions was 0.1−2.1% of NSCLC patients, with a high variability in both length and position of insertions within exon 20. Currently, available data are sparse and come primarily from studies based on single-center experiences, with data gaps across several large geographic regions and populations. Results also indicate a need to further explore underlying geographic variations in epidemiology. Larger, multi-center global studies will further help to refine the frequency of exon 20 insertions and other uncommon mutations in NSCLC. Epidermal growth factor receptor (EGFR) exon 20 insertions are identified in 4-10% of al EGFR mutations in non-small cell lung cancer (NSCLC) and are generally associated with primary resistance to first and second generation EGFR tyrosine kinase inhibitors (TKIs). In vitro and preclinical animal studies have shown that osimertinib exerts antitumor activity in EGFR exon 20 insertion positive NSCLC cell lines. We report on a cohort of advanced stage NSCLC patients, harboring an EGFR exon 20 insertion, that was treated with osimertinib. 17 patients with advanced NSCLC harboring an EGFR exon 20 insertion were treated with osimertinib 80 mg once daily, in four institutions in the Netherlands. Data were obtained retrospectively. EGFR mutation status was assessed by next-generation sequencing. Progression free survival (PFS), disease control rate (DCR) and objective response rate (ORR) were assessed using RECIST v1.1. Median age was 63 years (range 35 – 81), 71% was female and median number of prior systemic treatments was 1 (range 0 – 3). Ten patients (59%) received prior platinum-based chemotherapy, and 2 patients afatinib, one patient experienced stable disease for 11 months, the other patient showed progression. Among all patients treated with osimertinib, we observed 1 partial response, 13 patients with stable diseases and 3 with progressive disease as best response (ORR 6%). Two patients were still on osimertinib treatment at the cut-off date. Median PFS was 3.7 months (95% CI: 2.3 – 5.4 months). Six of seventeen patients (35%) achieved DCR at five months. Osimertinib has limited antitumor activity in patients with EGFR exon 20 mutated NSCLC, with an ORR of 6%. A subset of patients (35%) seems to derive benefit from osimertinib treatment with durable disease control for more than five months. Unlike common epidermal growth factor receptor gene (EGFR) mutations that confer sensitivity to tyrosine kinase inhibitors (TKIs) in non–small cell lung cancer (NSCLC), mutations in exon 20 of either EGFR or the human EGFR2 gene (HER2) are associated with insensitivity to EGFR-TKIs, with treatment options for patients with such mutations being limited. Clinical characteristics, outcome of EGFR-TKI or nivolumab treatment, and the presence of coexisting mutations were reviewed for NSCLC patients with exon-20 mutations of EGFR or HER2 as detected by routine application of an amplicon-based next-generation sequencing panel. Between July 2013 and June 2017, 206 patients with pathologically confirmed lung cancer were screened for genetic alterations including HER2 and EGFR mutations. Ten patients harbored HER2 exon-20 insertions (one of whom also carried an exon-19 deletion of EGFR), and 12 patients harbored EGFR exon-20 mutations. Five of the 13 patients with EGFR mutations were treated with EGFR-TKIs, two of whom manifested a partial response, two stable disease, and one progressive disease. Among the seven patients treated with nivolumab, one patient manifested a partial response, three stable disease, and three progressive disease, with most (86%) of these patients discontinuing treatment as a result of disease progression within 4 months. The H1047R mutation of PIK3CA detected in one patient was the only actionable mutation coexisting with the exon-20 mutations of EGFR or HER2. Potentially actionable mutations thus rarely coexist with exon-20 mutations of EGFR or HER2, and EGFR-TKIs and nivolumab show limited efficacy in patients with such exon-20 mutations. NSCLC, particularly adenocarcinoma, has been successfully treated with upfront targeted therapies according to respective oncogenic mutations in a tailor-made model. EGFR-TK inhibitors (TKi) have exhibited major responses, improving PFS, RR and even mOS (a subset treated with afatinib). This drug has emerged as the best option for those with uncommon mutations, but until now is broadly unknown its action in exon 20 mutations, which accounts for nearly 3% of all and, classically, is associated to worse response to 1st-generation TKi. Here, in this retrospective analysis, is reported the past medical history and clinical outcomes of two patients who presented with de novo EGFR exon 20 insertions: D770_N771insSVD and Ser768_Asp770dup. The patient were treated in two differents Cancer Centers in Brazil and the mutations were identified with Next Generation Sequencing (NGS) by Illumina HiSeqs of Foundation Medicine (FM) and the other by a local certified laboratory using Ion Torrent-PGM Thermo Fischer v5.0. Analysis were performed in tissue samples extracted from FFPE. The follow-up was obtained from electronic charts. Patient 1: never-smoker 66 y/o lady, without comorbidities, presented 12 mo ago with dry cough, thoracic pain and -10% of weight. CT scan revealed extensive ground-glass infiltration area and multiple bilateral pulmonary nodules. Lung biopsy pointed out a mod. differentiated adenocarcinoma of predominantly lepidic pattern (IHC: AE1/2+, CK20-, CK7+, Napsin A+, TTF1+). With this, rtPCR (Cobas Mu test v.2) detected an exon 20 insertion, thus ineligible to upfront EGFR-TKi. However, was chosen to re-analyze it using NGS (FM). After a TAT of only 2 weeks, we retrieved the result which showed a poorly described mutation: EGFR exon 20 insertion D770_N771insSVD. Afatinib 30mg/day was started and, only three days after the initiation, the patient decreased the dry cough and fatigue. CT scans showed stable disease after 45 days of continuous use. Patient 2 had a more extensive past medical history: 1L chemo, followed by nivolumab and docetaxel. Lastly, NGS revealed an uncommon EGFR exon 20 insertion (Ser768_Asp770dup). Rapid clinical improvement was observed (less fatigue and dyspneia), but occured liver progression in the first control, 4w after initiation. This study confirms that rare mutations have been increasingly seen due to the employment of improved sensitivity genetic techniques, like NGS. Furthermore, reveals two rare examples of rapid clinical response to afatinib in patients harboring EGFR exon 20 insertions. Finally, despite it could be an option for management of this broadly unknown situation, it suggests caution because of the short-lasting benefit in some.